Please refer to our stock # ic1 when inquiring. I am very pleased to offer this stunning bracelet from the high end accessories designer, Isabel Canovas. Isabelle was born in Paris on the “Night of Kings” in 1945, daughter to Genevieve Corre, and Blas Canovas, a Spanish fabric designer. The product of designers, she began work at an early age as accessories designer at Hermes, and later to Louis Vuitton. She received acclaim from Patrick Vuitton who felt she could help in modernizing the image of Vuitton in the 70‘s. After only one year, she left the company to join Christian Dior as head designer for a span of almost 10 years. At the age of 37, she opened her own boutique with husband Michael de Cornelius in the very high end and fashionable AV. Montaigne of Paris. Her luxurious take on accessories was widely popular, and she soon opened shop in 1985 on Madison Avenue, NY, and in 1988 on 27 Hermosilla, Madrid, Spain. Her customers knew that she never discounted or loaned pieces to anyone, no matter what the celebrity value was. This marketing strategy helped her customers know that the accessories would NEVER devalue with time. Her editions for each season were in small amounts, and often collections were theme based (circus, African, garden, etc). She achieved much acclaim including the “T Award” from Telva Magazine for best international designer, and multiple Dafnis gold metal awards. Unfortunately, her design career ended with the announcement of her store closing on December 2, 1992. Isabelle’s pieces rarely hit the secondary market, so I hope you will enjoy the following selection. 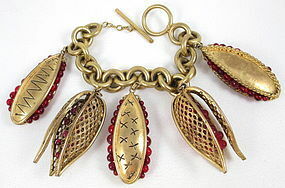 This stunning bracelet is 9 1/2" long and has five oversized 2 1/2 long x 1" wide fob charms with Gripoix glass accents. It has no markings but has all the details of Isabel's pieces of which I've owned many. It also comes from a client who purchased it in the 1980’s at her Paris attelier at 16 Avenue Montaigne. It is in excellent condition.